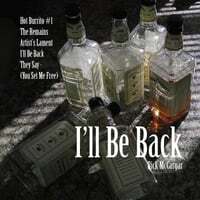 New Album of Original Songs: I’ll Be Back (Back With the Jack) by Rick McCargar! UPDATE: Thank you for the support. The album release is going very well! Truly appreciated! Click on the image to download any of the songs, or the full five-song EP from CD Baby (best deal for the artist) or from iTunes, and thank you for your support! The album “Back With the Jack” is a combination of Frank Zappa 1970’s swirling flanger style ironic parody in “Back WIth the Jack” about a trailer park party that ran out of Jack Daniel’s; a love song about how people affect our lives with the things “They Say”; “You Gotta Get Up and Riot! is a song that protests the NSA surveillance state; while “Streaming Sweatshops” points out that recording industry companies are again cheating artist’s in royalty payments; and I included an alternate take with megaphone vocals for “Back With the Jack”. Hope you think about a couple of them, and enjoy them all. Thank you for listening, and feel free to drop me a note if you liked these songs, or have a request. You can buy the album on cd baby, and it’s the best deal for the artist (in this case…me)! Thank you! Click on the image below to go to cdbaby to buy a song or the full EP. By Rick McCargar  Posted in Entertainment, lifestyle, Music, Uncategorized	 Tagged acoustic songs, Back with the Jack, buzz, funk, music, news, original music, original songs, pop, Rick McCargar, rock, She's A Sorry Excuse for a Woman, Streaming Sweatshops, They Say, You Gotta Get Up And Riot!